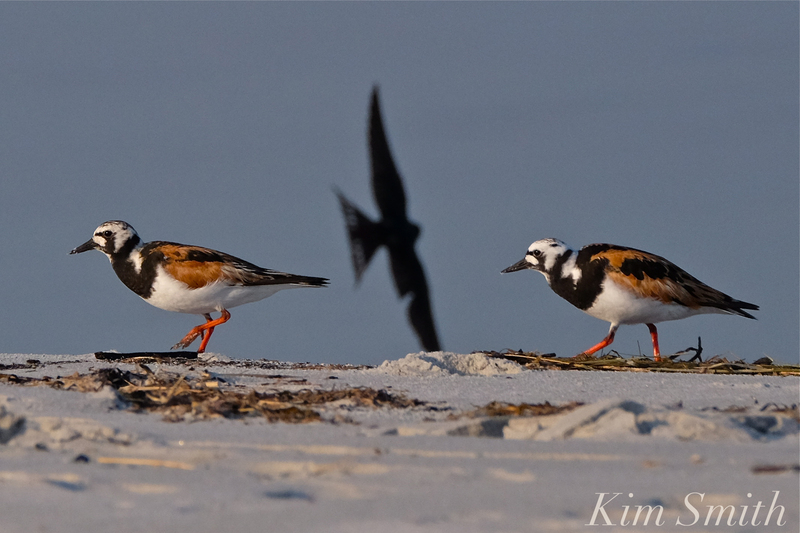 This entry was posted in #sharetheshore, Birds of New England, Gloucester Plover, Piping Plover, shorebirds and tagged #sharetheshore, animal advisory committee, Charadrius melodus, Gloucester, Gloucester Plovers, Piping Plovers, shorebirds on October 17, 2018 by Kim Smith. OUR GOOD HARBOR BEACH KILLDEER PLOVER CHICKS! 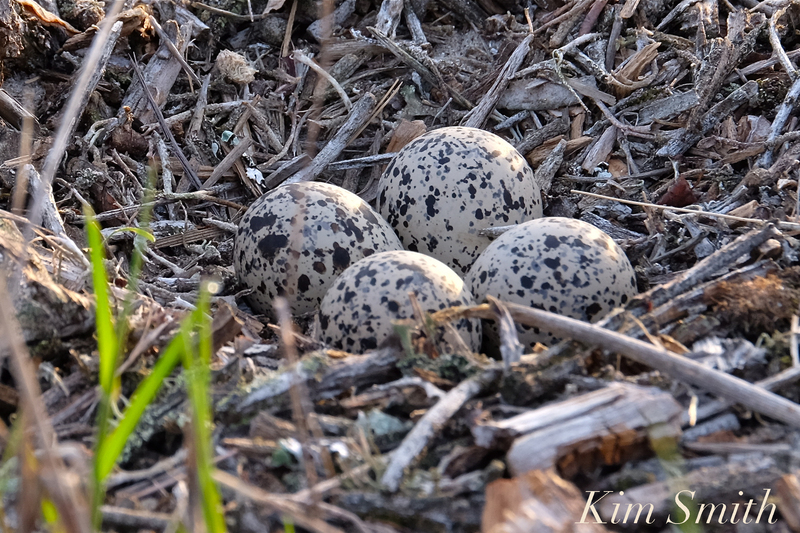 You may recall that several weeks back we posted a photo of a Killdeer nest with four eggs. 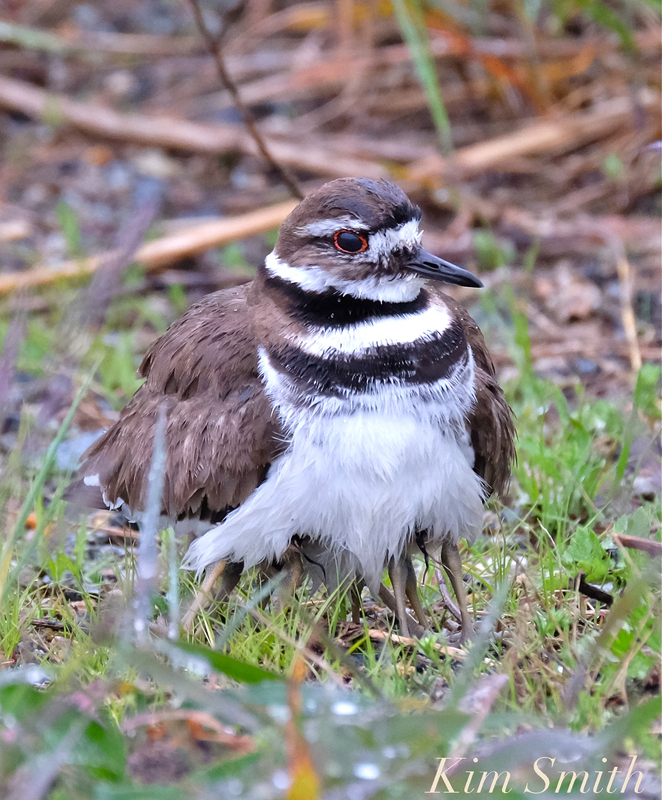 I only discovered the nest because each and every time anyone walked past, a Killdeer would call shrilly and drag its wings through the dunes in a dramatic display of “broken wing” trickery. I would often play along and see how far away the Killdeer would take me until one morning I decided to see what it was they were hiding. Off to the side of the path that leads to the beach, not more than six feet away, was a loose scrape of dirt and sticks, with four perfect Killdeer eggs! I had no idea when they had been laid, so there was no way of knowing when the chicks would hatch. 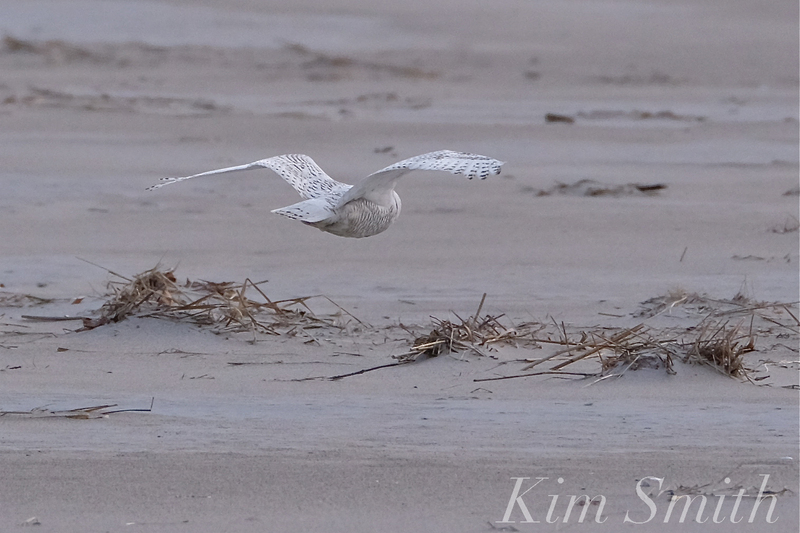 Each morning on my way to check on the Piping Plovers I’d take a peak, until one day there weren’t any. How sad I thought, and wondered if a predator had eaten the eggs. But the nest had not been disturbed and there were no broken egg shells. A mystery. The following morning I checked on the Piping Plover nest in the parking lot. 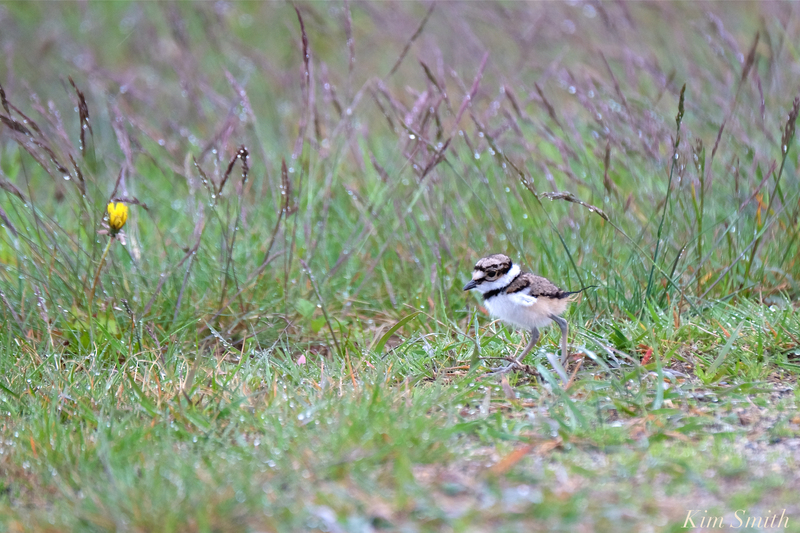 It was drizzly but there were two Killdeers near to where the PiPl exclosure is located. I sat in my car watching the adult Killdeers when to my delight and amazement, out tumbled four teeny chicks from under Mama Killdeer. 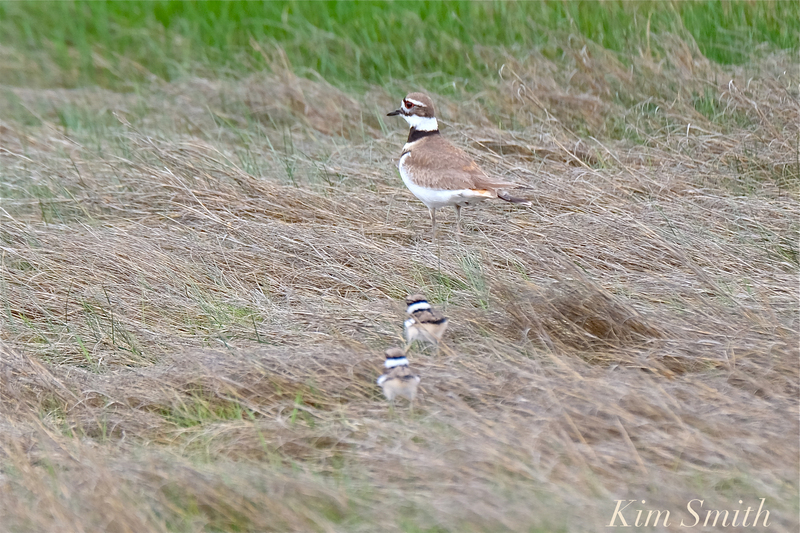 A car makes the perfect blind and for quite some time I photographed and filmed the Killdeer family. Off and on during that rainy day I stopped by to check on the Killdeers. Because of the weather, the parking lot was virtually empty. Tiny tufted black, brown, and white feather balls atop overly long spindly legs, the baby birds spent all their time zooming here and there, foraging on itsy bitty insects in the grass and gravel. When not foraging, they would run under Mom or Dad to warm up on that damp drizzly day. 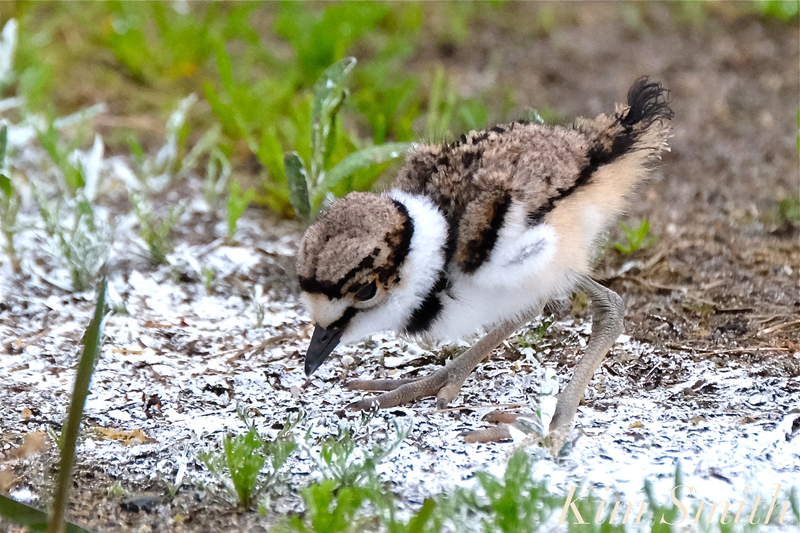 Just like Piping Plover chicks, Killdeer chicks are precocial birds and can feed themselves within hours after hatching however, because they are so tiny, they lose body heat relatively quickly. The chicks need the warmth provided by snuggling under Mom and Dad. 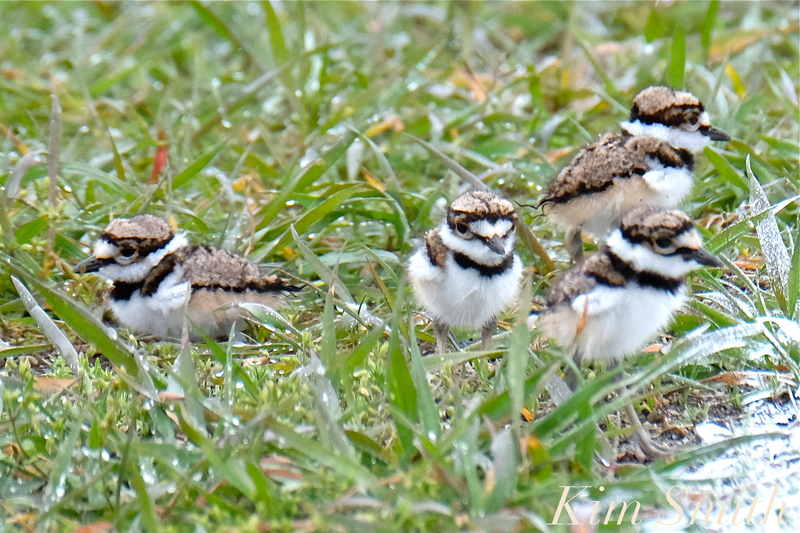 The next morning it was still drizzling, and the Killdeer family was still in the same location! I watched them for a bit, when a man showed up with his dog. 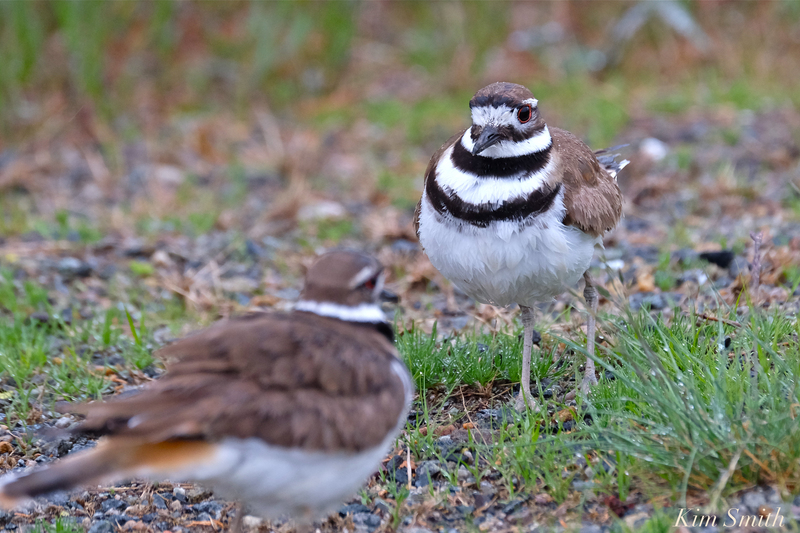 The Killdeer parents went into high alert and did their best distraction displays. The dog chased the adult Killdeers around the parking lot while I spoke with the man. 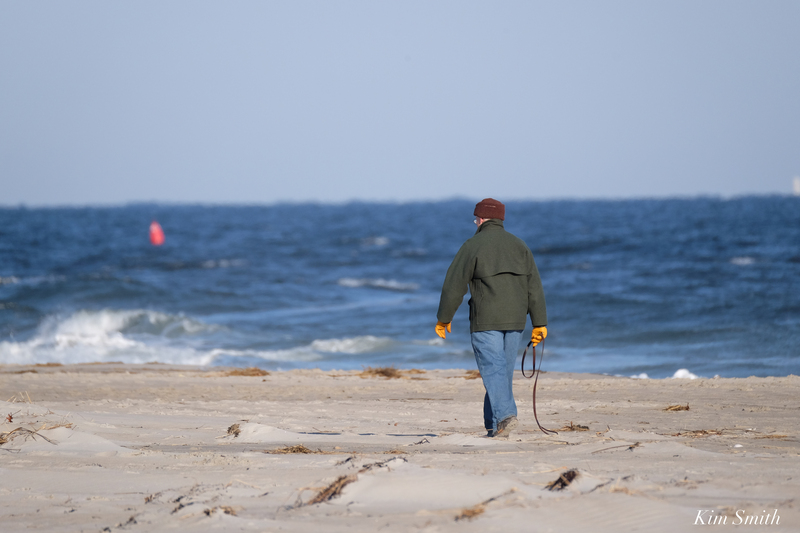 It is the same man who brings his dog to Good Harbor Beach via the footbridge end at the close of the day, after the lifeguards and dog officers have left. This was a tremendous problem last year after the Piping Plovers hatched. Last summer I was too busy preventing his dog from squashing a PiPl chick to get his license plate number, but not this time. The man and his dog left the parking lot. 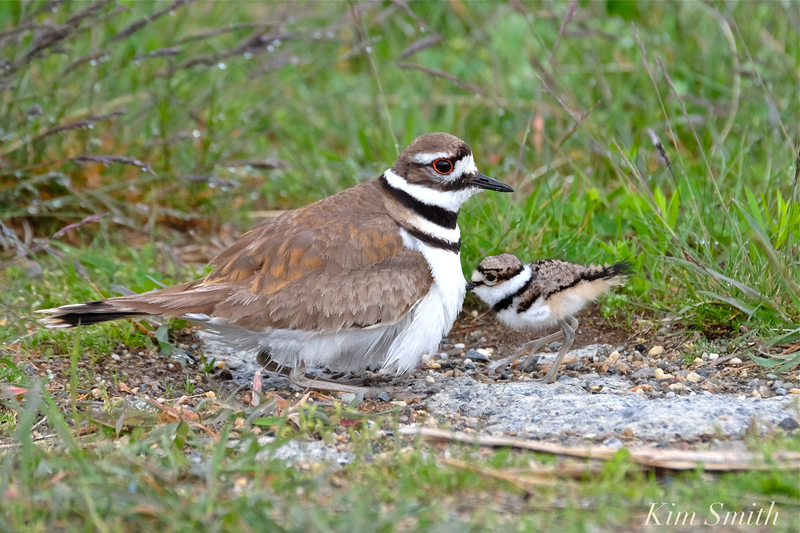 Shortly after the dog encounter, both Killdeer parents led the chicks into the marsh. To see the chicks navigate over the incline at the edge of the marsh was amazing; it must have seemed like fording a mountain to them. I’ve looked but have not seen the family since. I am hoping that they are thriving and growing in the marshland. 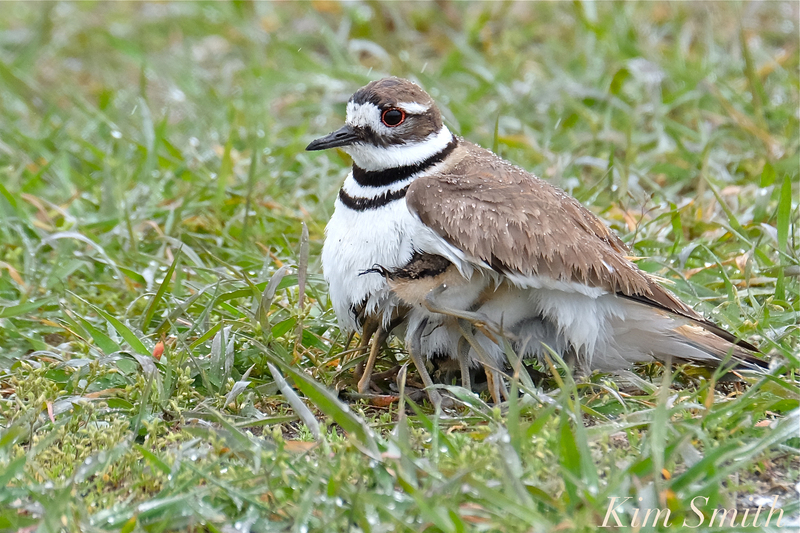 We don’t hear as much about Killdeer Plovers because they are not an endangered species. Killdeers are found in every state of the continental US, Alaska, Canada, Mexico, Central and South America. They are the least shorebird-like of shorebirds because they breed and dwell in many types of habitats including grasslands, fields, urban areas, gravel pits, airports, parking lots, athletic fields, and golf courses. Despite their super ability to adapt to human habitats, it is a species in decline. Killdeers begin courting in our area in March. Although I imagine they have been nesting at Good Harbor Beach for a longer period of time, I only have a record of Killdeers nesting at GHB going back three years and it is yet another important reason as to why humans and pets should not be traipsing through the dunes. It is difficult to tell the difference between a male and female Killdeer unless they are side-by-side, and even then, still challenging. The male is a bit larger. 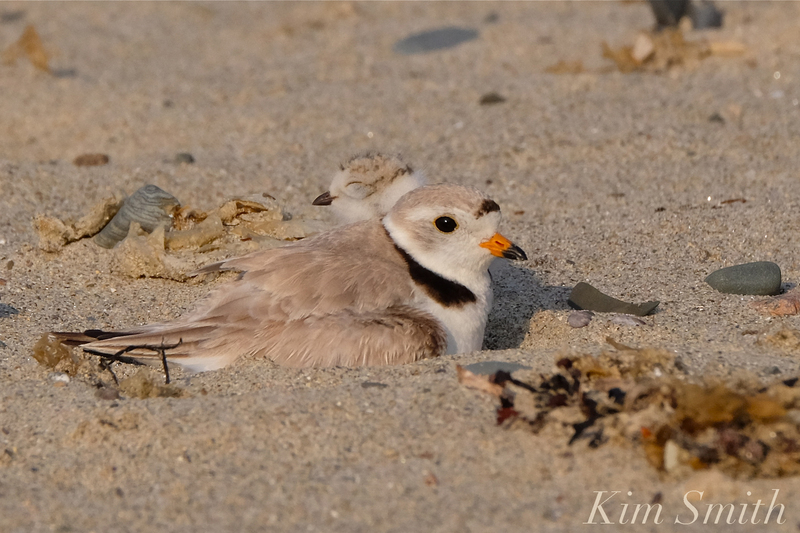 This entry was posted in Birds, Birds of New England, Cape Ann Wildlife, Gloucester, Good Harbor Beach and tagged #ShareThe Shore, Beautiful Birds of Cape Ann, Charadrius melodus, Charadrius vociferus, distraction display in plovers, Good Harbor Beach, Killdeer Chicks, Killdeer eggs, Killdeer nest, KILLDEERS, Piping Plovers, Plovers, shorebirds on June 5, 2018 by Kim Smith. 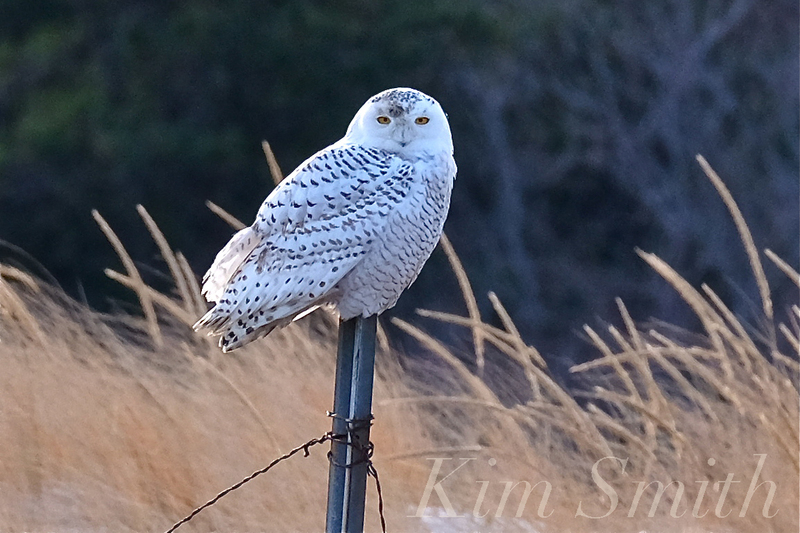 WINTER BEAUTY ABOUNDS WITH SNOWY OWLS, HORNED LARK, SNOW BUNTINGS, YELLOW-RUMPED WARBLERS, DUNLINS AND MORE! 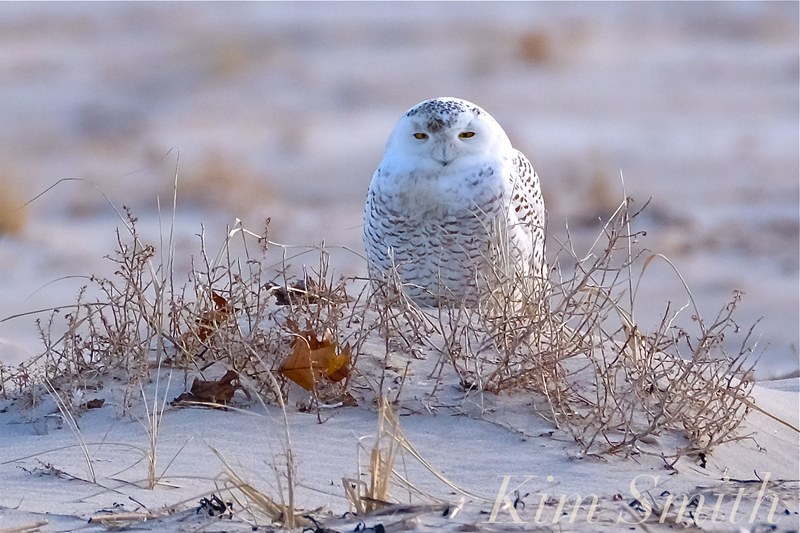 With early predictions of a Snowy Owl irruption heading our way and several sightings in Gloucester, I have been periodically popping over to Cranes Beach in Ipswich. Thanks to Bill Foley, Cranes Chief of Police (and Kate’s awesome Dad! ), who showed me around and provided some great tips on locating the Snowies, I was able to find one second time out. The first day was a bust because a dog owner had allowed his dog off leash. I watched the dog chase the Snowy, who then headed far and away over the dunes. This made me so very sad for myriad reasons, but especially so at Cranes Beach because there is a fabulously huge area that dogs are allowed off leash. Anyhow, seeing the Snowy that first day, and knowing he was there, was all I needed to keep trying. That day, a flock of Dunlins was resting in the sand, with one lone Sanderling, and there was a small flock of Snow Buntings in the parking lot. Feeding amongst the flock was, what I believe to be, a female Horned Lark! Second day out was wonderfully rewarding. 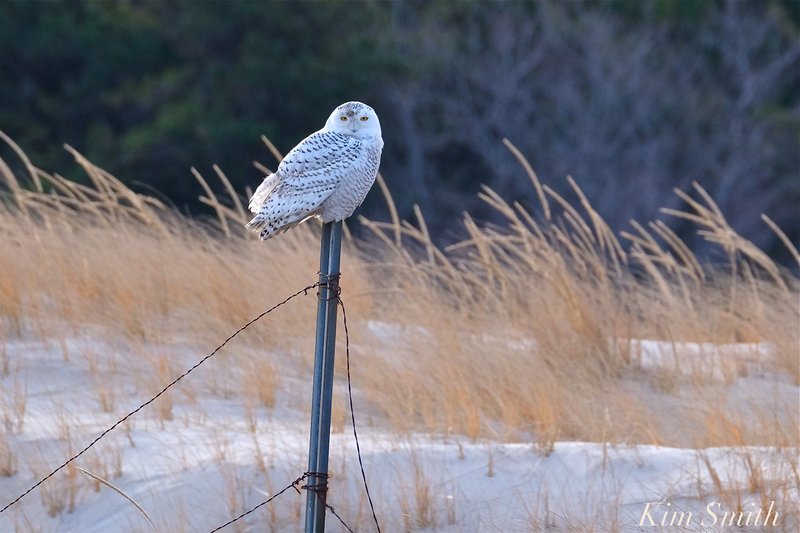 Approaching the stairs to descend to the beach, I inadvertently startled a Snowy and he flew from the area, way, way down the beach, perching on one of the poles that mark the access to the Green Trail. Off I trudged in 15 degree weather, keeping my eyes peeled on where he was resting. He stayed for quite some time while I stood back at a great distance, not wanting to disrupt his hunting. Suddenly, and with what I thought, great bravery, he flew quite close and past me, heading over to the sandy beach. I wasn’t anticipating his flight and didn’t get much of a photo, but it was exquisite to see. The temperature had climbed to twenty, but I was getting worried about exposed photo fingers and frostbite. After taking a few more photos and some footage of the Snowy in the sand, I very reluctantly headed home. Today I didn’t see the Snowy Owl, but did find a scattering of Snowy feathers in the sand, in the same area where one had been hunting the previous week. I showed the ranger at the gate, Emily White, the feathers and she confirmed they were from a Snowy. She said that hawks and falcons will attack Snowies. I didn’t see any bones or body parts, so hopefully it wasn’t a fight to the death. Emily was super helpful and shared lots of useful information. This year’s Audubon Christmas Bird Count at Cranes was relatively uneventful, with fewer numbers counted than usual. 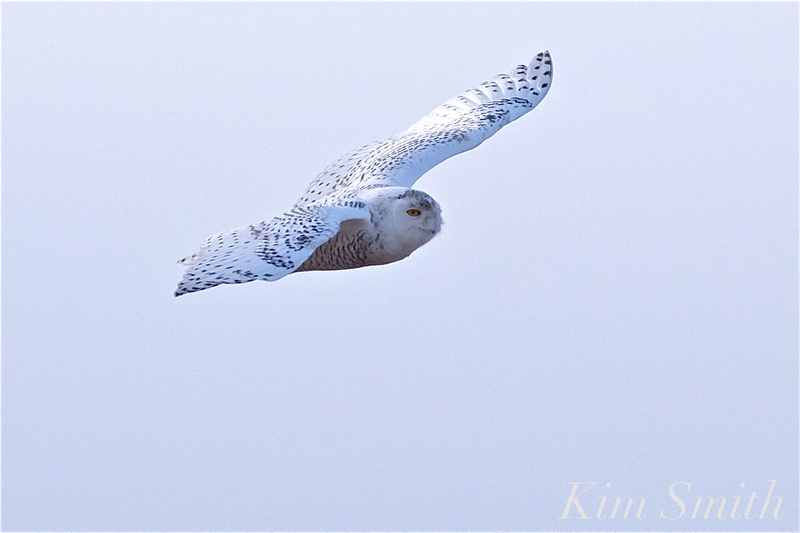 Many more beautiful birds will be arriving to our shores in the coming weeks, foraging in the dunes and shrubby habitat, and hopefully, there will be lots more Snowy Owl sightings! Song Sparrow eating ripe beach grass seed heads. This entry was posted in Birds of New England, Cape Ann Wildlife, Life at the Edge of the Sea, Native Plants and tagged Bill Foley, Bubo scandiacus, Calidris alpina, Crane’s Estate, Cranes Beach, Dunlins, Emily White, Eremophila alpestris, Horned Lar, Melospiza melodia, Passerculus sandwichensis, Plectrophenax nivalis, Sanderlings, Savannah Sparrow Ipswich Form, scofflaw dog owner, Setophaga coronata, shorebirds, Snowy Owl, Song Sparrow, Songbirds, Yellow-rumped Warbler on December 27, 2017 by Kim Smith. Common Tern delivering breakfast to its fledgling. Here are a collection of recent photos of different species of shorebirds and songbirds gathering and migrating along Cape Ann beaches that Little Chick may encounter on his journey south. 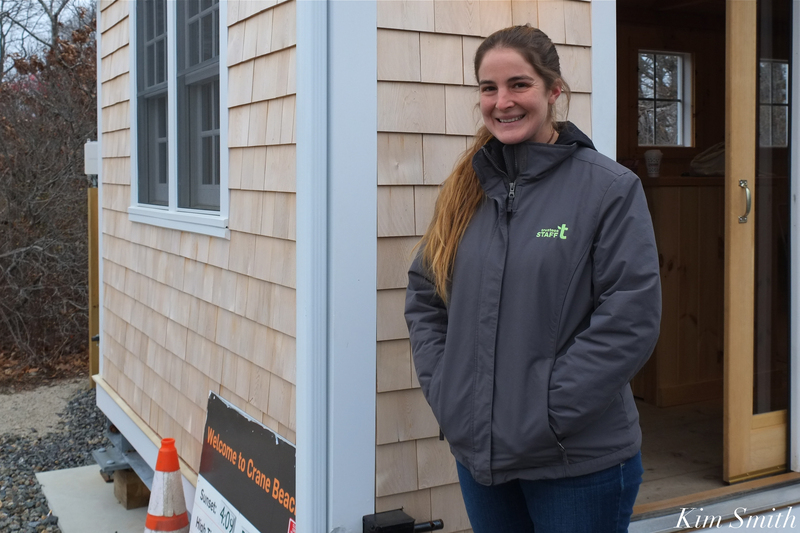 During the spring breeding season Piping Plover mating adults chase all other birds out of their territory, from the largest Black-backed Gull to the tiniest Song Sparrow. 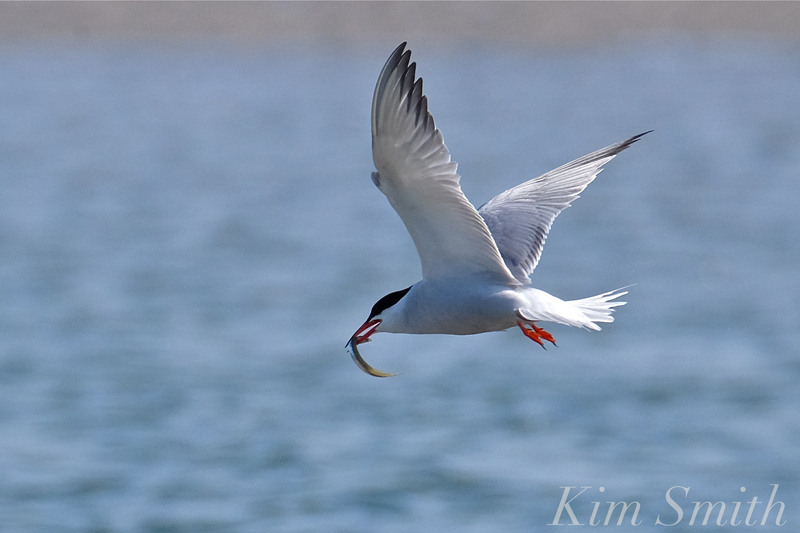 At this time of year, during the summer southward migration, you’ll often see PiPl feeding alongside other PiPl, as well as with Semipalmated Plovers, Black-bellied Plovers, Killdeers, peeps, terns, and gulls. 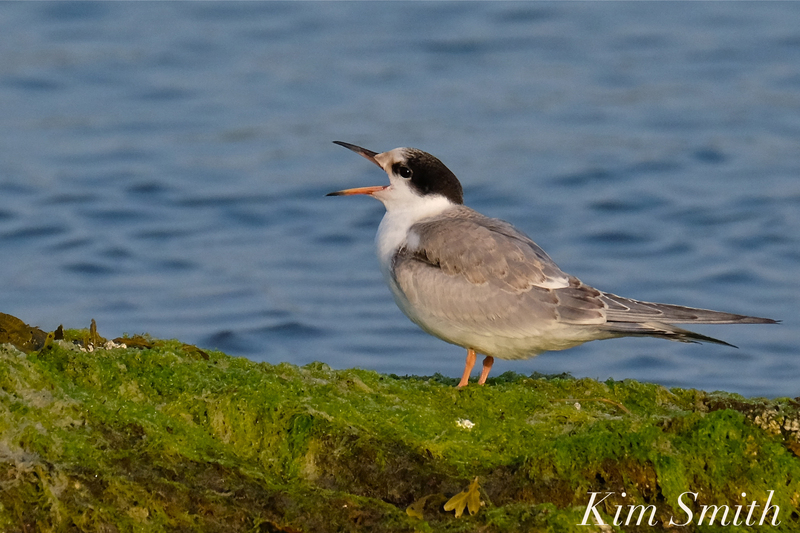 Common Tern fledgling squawking for breakfast. Won’t someone, anyone, please, please feed me! 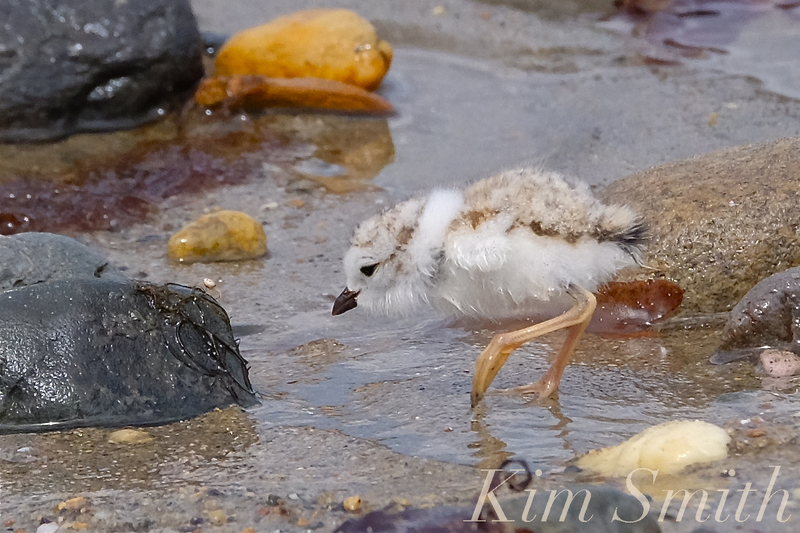 Unlike Piping Plover chicks, Common Tern chicks cannot feed themselves at birth. 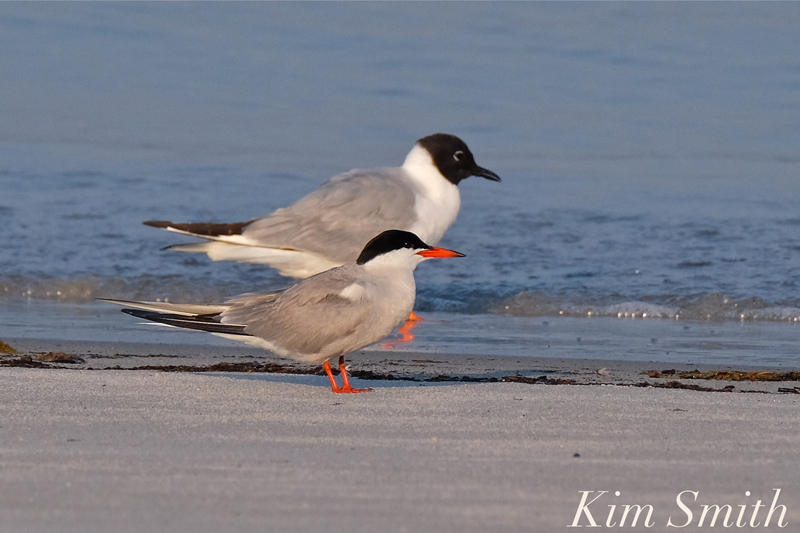 Common Tern chicks can walk and swim, but it will be many weeks before they learn to fish. 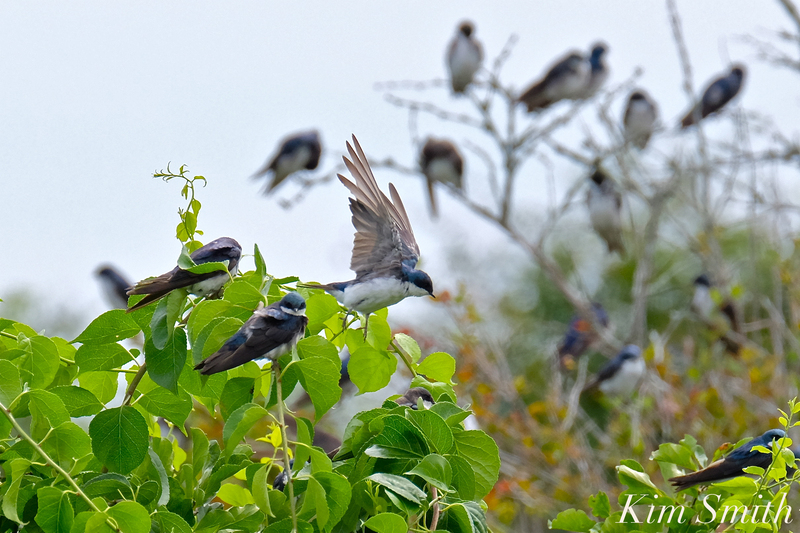 Tree Swallows massing, foraging in dunes rich with insects and berries. Compare Common Tern in the foreground to Bonaparte’s Gull in the background. Both have red-orange legs and feet and both are black-headed. The easiest way to differentiate when on the beach is the Common Tern’s bill is orange; the Bonaparte’s Gull’s bill is black. Least Sandpipers are the smallest of peeps. Note how beautifully camouflaged are they in the drying seaweed. Daybreak and early morning are often the most beautiful times of day to see wildlife. 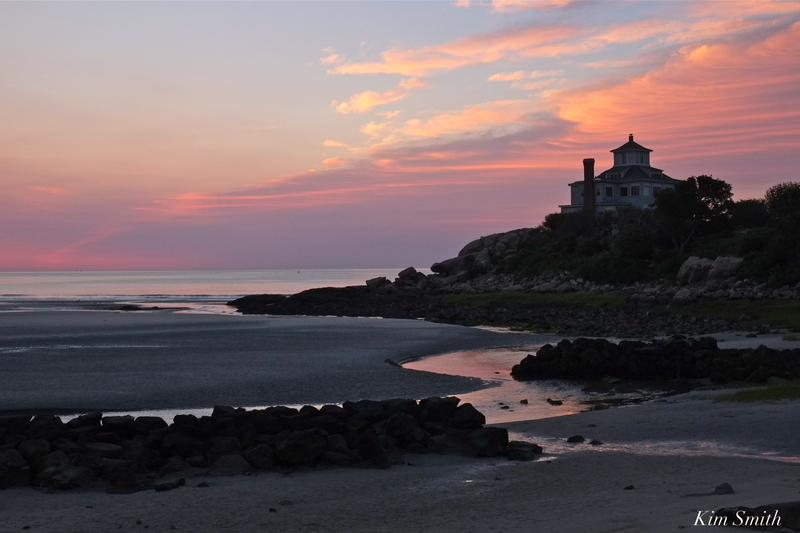 This entry was posted in Birds, Birds of New England, Gloucester, Good Harbor Beach, Life at the Edge of the Sea, Piping Plover and tagged Beautiful Birds of Cape Ann, BLACK BELLIED PLOVERS, Bonaparte’s Gulls, Charadadriidae, Charadrius melodus, Charadrius semipalmatus, Charadrius vociferus, Common Tern, Common Tern fledgling, Gloucester, Good Harbor Beach, Killdeer, Least Sandpiper, Peeps, Piping Plover, Ruddy Turnstone, SEMIPALMATED PLOVERS, shorebirds, shorebirds Massachusetts, terns, Tree Swallows massing on August 9, 2017 by Kim Smith.